The first thing to remember is that resilient is vinyl and vinyl is resilient. The names each refer to the same, hard surface that is the most popular hard surface in America. The various shapes, colors, designs and sizes are sold in tile and large rolls. Resilient styles range from vinyl tile or sheet, linoleum tile or sheet, rubber tile or sheet, and vinyl composition tile. Resilient is affordable, durable, moisture resistant and easy to clean. No surprise, that resilients are popular choices for homeowners, landlords, and commercial structure developers. Homeowners typically choose a resilient for bathrooms and kitchens, as well as entryways and foyers. Those prone to allergies benefit from a resilient floor because dust can not be trapped on the smooth, hard surface. Commercial developers rely on resilient flooring for high traffic sites such as hospitals, retail outlets, and schools. Attributes that cause resilients to be the best choice for commercial settings include the ease of disinfecting, which increases sanitary conditions. A history of long performance makes resilients good choices for areas prone to tough traffic, such as dormitories, restaurants, grocery stores and public restrooms. It’s easy to shrug off the word “resilient” and believe that it’s simply another term for vinyl. While that’s a basically correct assumption, there are more materials in the resilient family that have efficient and expertly serviced both residential and commercial customers for decades, such as linoleum, rubber, cork, polyurethane and even asphalt. A resilient floor has a great history of performance because of its affordability, easy maintenance and safety factors, as well as its unlimited array of colors, styles, textures and patterns. The only negative associated with resilient flooring is its tendency to wear faster than other hard-surfaced floors like hardwood or laminate. Expect for a laminate to need replacing about every ten years. Resilient is king in terms of variety of appearances. Like laminates, resilient floors can mimic wood, stone, ceramic and even brick. If your project is meant for a high traffic residential or commercial area, resilients are not manufactured to withstand the pressure and not tear or stain as easily as its predecessors. Unlike carpeting or hardwoods, resilients can be installed over most any existing floor, including wood, other resilients, and concrete. The only necessary component is that the floor must be flat and without noticeable grooves, gouges, or bumps. Inlaid: The veteran of the group, inlaid vinyl sheeting usually sports the traditional symmetrical patterns commonly associated with vinyl flooring. Inlaid has an easy-to-maintain clear wearlayer coating that protects the material from wear. Rotogravure: This relatively new product allows for a wide spectrum of designs and colors to be created in vinyl flooring. Like the inlaid, however, the clear coating protects the artwork. Wearlayer: The thicker the protective layer, the more expensive the product will be, but the longer the flooring will last. Wearlayers are the shield between your floor and traffic hazards, such as spills, stains, scratches, rips and tears. Inexpensive floors may accept staining more easily because the wearlayer isn’t as strong as its more pricey counterparts. Your budget and your expected use of the floor should dictate choices in wearlayer. While the linoleum floor is part of the resilient family, it is not part of the vinyl family. Instead, linoleum is a natural product that needs a completely different installation and maintenance program from its resilient cousin, vinyl. Linoleum is part wood, part stone, and part grass, tied together with resins and oils. Linoleum has been around for more than 150 years, but new advances in colors and styles are making this natural product popular again. Linoleum is almost as versatile as vinyl in the type of colors and patterns it offers, and both commercial and residential consumers find linoleum to be exactly what they want and need for their project. Linoleum can be installed in either a sheet or tile format. The best assets of linoleum are found most often in commercial settings, because the fibers used to build a linoleum floor are able to resist burning, wear, and can be kept highly sanitized more easily than other flooring choices. Because linoleum is made from natural products, a process called “blooming” will occur to a linoleum floor. Blooming means the floor changes color slightly because of exposure to a light source. It doesn’t fade, but rather it becomes its natural color. Conversely, if a section of linoleum is protected from light, the natural fibers are unable to bloom, and yellowing will occur. The floor is able to readjust itself from this yellowing once that area is exposed to light. Environmentally-conscious and performance-driven consumers have a segment of the resilient family to choose from: Rubber flooring. A sustainable and durable flooring option, rubber flooring is typically used in commercial environments. Along with excellent slip resistance, rubber flooring offers comfort underfoot, ease of maintenance, and is available in a large assortment of colors and designs, in both tiles and rolls. Rubber flooring provides the design and performance features necessary to create a sustainable and healthy environment. Another resilient surface is cork flooring. This surface was popular in the 1950s and 60s, and is experiencing a comeback with designers and environmentally-conscious homeowners. A cork floor is easy to clean and maintain, and is available in tiles or planks. Its natural fibers allow for superior comfort and extended durability. Because of its natural makeup, cork flooring resists mold and mildew and is a good choice for commercial settings needing high sanitization or homeowners with allergies. It is recommended to have an INSTALL contractor install your resilient floor. These experts have the experience and are ready and available to help you. These contractors have the support of an international training program to ensure that every facet of resilient flooring installation is done right. These contractors will not only see to it that the floor is installed properly, but they will teach you how to care for the floor. Resilient flooring is typically installed using a variety of adhesives that are made specifically for the type and style of resilient floor to be installed. Some resilients, including vinyl and asphalt, come in tile format and some already have self-adhesive backing. Again, it’s a wise move to let an INSTALL professional install your resilient floor, so that you can benefit from the years of wear the floor is meant to provide. 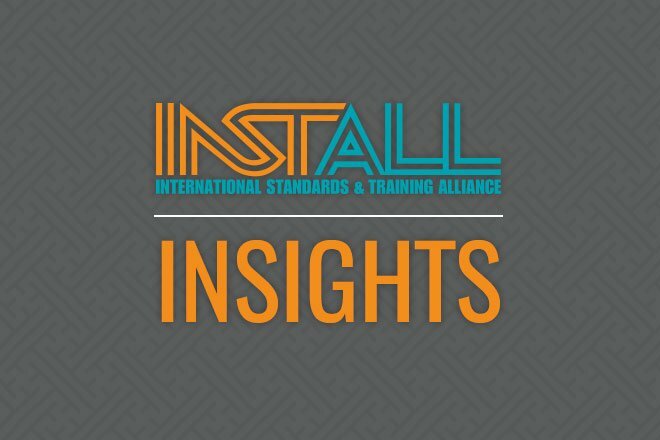 Access the professionalism of the international INSTALL network through our Alliance Partners here.